The study of disasters provides a context to understand how individuals, families and social systems operate under extreme stress, how to respond in disrupted social systems, and what can be done to aid those harmed by the disasters. Within these events individuals and groups under extreme stress are observed to demonstrate the best and worst of humanity, and study of behaviors in these events provide insights into individual and community coping mechanisms. In disaster human behavior is a response to events occurring at the intersection of three sets of interacting systems, the socio-ecological system, the system of collective, social behavior, and the individual actor’s cognitive. Each of these systems changes and adapts in response to the others as part of a complex adaptive system of systems. The conception of disaster as a disruption of intersecting complex adaptive systems is too abstract to improve understanding. Instead real-world case studies must be used to provide context, enable process tracing and identify causation. Samuel Prince’s classic dissertation study of a catastrophe documents the foundational features of disaster and provides evidence for the three interacting systems with behaviors from the environment, groups and individuals. Both as a study and a story the event is intrinsically compelling with an improbable series of disruptions provided by war, earthquake, fire, flood, famine and storm (Prince 1920, p.28). In December 1917, after a failure in ship signaling, French munitioner transporting explosives collided with an empty Belgian relief ship vessel in the ocean terminal of Halifax, Canada. 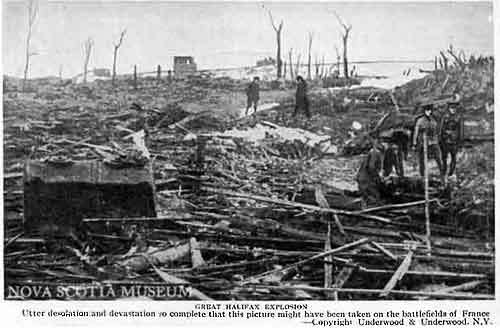 The resulting explosion brought World War I to the shores of Canada, shaking the ground, showering soot, oil, water and shrapnel, producing a tidal wave of sea that flooded the City of Halifax, triggering gas explosions and a fire that wiped out the north end of the city just before a series of winter storms brought blizzards, wind, rain, flood and freezing temperatures to the area. The event impacted the entire social and environmental system of approximately 50,000 people and forced every individual and social organization to respond in a massive engagement of social change. Globally, aid funding poured in from China, New Zealand, Great Britain and the United States (Ruffman and Findley, 2007), and locally the everyday activities of individuals, families, businesses and government were suspended as citizens in desperate need struggled to deal with the losses; 2,000 dead, 6,000 injured, 10,000 homeless, and ~$35 million in property destruction (Prince 1920, p. 26). Over a period of days and months the individuals, families, social organizations and the larger socio-ecological system were overwhelmed by necessary, non-routine activities required to survive and recover. Individuals struggled through varying physical and emotional states to make decisions and act in adaptation to the disaster. Prince found that the people of Halifax, Halogians, experienced varying degrees of shock, helplessness, hallucination, delusion, fear, grief, sorrow, kindliness, sympathy, heroism, instinct, self-help, mutual aid, blame, scapegoating, and primitive instincts. At the time of the impact people fled out of a sense of preservation or fought to prevent the explosion and fires. After the impact people were engaged in searches for loved ones, rescue and aid or recovery from injury. Individuals who were physically and mentally able and with relevant social roles, community leaders or “big men” of civic and philanthropic work, public utility workers, medical professionals and social specialists put tremendous energy into the response efforts. Within hours of the explosion existing social organizations like the military, play actors and firemen adapted their activities to become first responders. Refugees informally grouped together for a sense of security and safety, and other groups emerged in imitation to provide improvised shelter and clothing and food depots. Formal social organizations resumed activities more slowly with the first of these being the public utilities providing telegraph service, gas and lighting, and rail transportation. 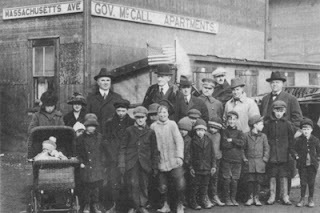 In the three days following the explosion newspaper, postal service and banks opened up, and ‘social specialists’ began to converge on the city to provide medical and rehabilitative care. Regular city council meetings recommenced two weeks, and the first businesses opened back up four-five weeks after the explosion. Special laws were enacted to ensure the safety of Halogians during the time of disaster recovery. Results from a quickly appointed investigative task-force attempted to find the cause of the explosions and fix responsibility. Responsibility for the explosion was not asserted, but the principles of restitution and indemnity in disaster were formalized (Prince 1920, p.95). The focus of energy and funds to the rebuilding Halifax led to an acceleration of city growth. It took only three months to clear the explosion debris from devastated areas by using 950 men and 270 horses working 10 hours a day (Prince 1920, p.78). Such recovery was only possible through the collective efforts of not only its own citizens, but also the contributions from more than 200 cities around the world (Prince 1920, p.78). The environment and the human-built system set the context in Prince’s study. 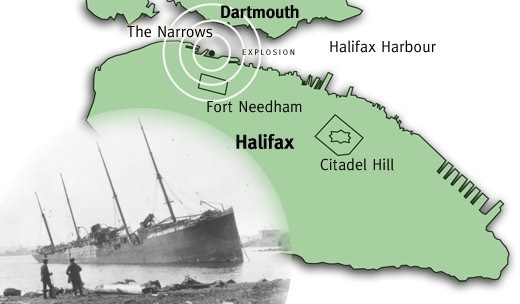 At the time of the disaster Halifax was a developing military town and geographically situated in the Northeast of Canada with a narrow ocean strait used as a through-way for ocean-going commerce. Thus situated, the city was vulnerable to accidents caused by increases in ocean traffic and the transportation of lethal cargo. After the disaster new laws were enacted to improve safety at sea and the inspection, control and handling of explosives in harbors (Prince, p.109; Dynes and Quarantelli, 1993). The city and its ocean piers were also rebuilt to better accommodate future commerce. City planning and improvement efforts widened streets and rezoned land for commercial, public use and residential housing. The disaster became the impetus for an acceleration of the development of the city from a sleepy military town to a regional maritime commercial hub in a larger network of commercial ports. Prince concluded that the disaster had created a period of fluidity in which social change could be achieved, and he was able to document these changes with new social organizations, coordinating institutions for medical and social care, new social legislation, and improvements in the built-environment of Halifax. As disaster studies expanded, the Halifax disaster and Prince’s study has become a template for the disaster experience to which academics later mapped empirical data and identified human behavior in times of stress (Fritz and Mathewson, 1957; Tyhurst, 1957; Wallace, 1956; Carr, 1932). Prince lays out the groundwork findings of individual, collective and environmental system behaviors that show how the destruction of disasters create social vacuums in which new behaviors and social organizations emerge. His work can also be analyzed as an intersection of individual cognitive systems that trigger emotional and rational behaviors, groups who emerge to collectively respond to the environmental threats, and the environment that provided a disruption triggered by human error. Although it is impossible to trace the infinite number of behavioral causations, the aggregation of these behaviors results in a set of system interactions that can be analyzed to provide greater understanding of the processes at work in disaster. Carr, Lowell Juilliard. 1932. “Disaster and the Sequence-Pattern Concept of Social Change.” American Journal of Sociology, 207–218. Dynes, Russell R., and Enrico Louis Quarantelli. 1993. “The Place of the 1917 Explosion in Halifax Harbor in the History of Disaster Research: The Work of Samuel H. Prince.” http://udspace.udel.edu/handle/19716/576. Fritz, Charles E., and J.H. Mathewson. 1957. “Convergence Behavior in Disasters; a Problem in Social Control.” Publication 476. Washington, D.C.: Committee on Disaster Studies National Academy of Sciences - National Research Council. Library of Congress. Prince, Samuel Henry. 1920. “Catastrophe and Social Change: Based upon a Sociological Study of the Halifax Disaster.” New York: Columbia University. Ruffman, Alan, and Wendy Findley. 2007. 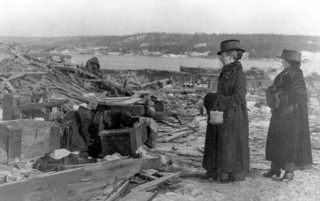 “The Halifax Explosion.” http://www.halifaxexplosion.org/intro.html. Tyhurst, J. S. 1957. “Psychological and Social Aspects of Civilian Disaster.” Canadian Medical Association Journal 76 (5): 385. Wallace, Anthony F. C. 1956. “Human Behavior in Extreme Situations: A Survey of the Literature and Suggestions for Further Research.” 390. Disaster Study. National Academy of Sciences -- National Research Council. 56-60013.